Day after day this week, both gold and silver spot values trekked forward by noticeable margins. In fact, since the end of last week, whatever movement has taken place on the charts of gold and silver has been almost exclusively of the upward variety. If you are confused as to how metals are performing so well, the answer lies in the current outlook on interest rate hikes and when they will occur next in the United States. For most of this 5-day trading session, the global marketplace was not on the receiving end of many new developments. In fact, very few noteworthy pieces of economic data nor geopolitical happenings made their way to the discussion, and as a result we witnessed the continued speculation with regard to what will happen to interest rates as well as when. If you are tired of this conversation continuing almost incessantly you might as well stop reading now, because there wasn’t much else on the minds of global investors. As we look forward to the week to come, I do not think there will be much of a shift in the topic of discussion, because the Federal Open Market Committee is going to hold their monthly policy meeting Tuesday into Wednesday, with a post-meeting address to be made by Janet Yellin. Ever since the latter parts of last week, the global marketplace has been the epicenter of a lot of frenzied activity. The reason for this is a simple one—investors are no longer convinced that interest rates will be risen as a result of next week’s Federal Reserve policy meeting. This change in thought has come about mostly because of the much poorer than expected tone of the May employment report that was released last week. In the Labor Department’s report, it was shown that fewer than 40,000 new, non-farm payrolls were created during the month of May. This data was shocking and flew directly in the face of expectations that held that a minimum of 100,000 new jobs were created last week. When you consider the fact that the likelihood of interest rates being risen depends directly on the tone of US economic data, it is easy to see why this single report was enough to send investors everywhere reeling. Though this type of reaction coming as a result of one single piece of data may seem shocking, the fact of the matter is that the Labor Department’s report on employment growth is arguably the single most important piece of economic data delivered every month. For gold and silver, this change in thought on the part of investors all over the globe is something that has dramatically given spot values a boost. In little more than a week, both gold and silver have been able to recover much of the value that had been lost in the early parts of May. 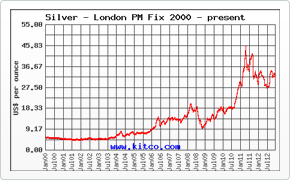 Now, silver is back up above $17/ounce while gold is inching ever-nearer to the $1,300 threshold. If things continue as they have gone over the past week and a half or so, gold and silver might hit new highs just in time for the inevitable slowdown brought on by the summer months. Though it is far too early to speak with any certainty with regard to gold and silver’s near-term prospects, the simple fact of the matter is that, at the present moment, the future of gold and silver is looking brighter than it has at any point over the last 30 or so days. It will be interesting to see, come Monday, if the upward movement of gold and silver can be built upon, or if profit-taking will push spot values back down a bit.